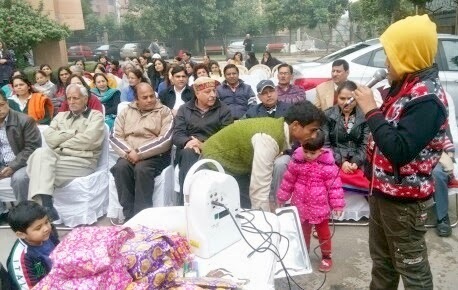 66th Republic Day was celebrated at New Rashtriya Apartments, Plot No. 15, Sector 18-A, Dwarka, on the 26th January, 2014, from 11.45 AM onwards. Initially, our National Flag was unfurled by the President of the Society and it was followed by singing of National Anthem by one and all, which was followed by distribution steaming coffee which was quite refreshing in otherwise cold weather prevailing for the last couple of weeks. Most of the members and many other residents had assembled in the Society premises (along with their family members) in a very happy, elegantly dressed and in a gaiety mood. The young budding artists were really bubbling with energy and enthusiasm. Then, cultural programme was started and some small children sang patriotic songs, poems etc. Some small children who did not remember any poem or a song to sing, just came to the stage and were seen shouting slogans like Vande Matram, Bharat Mata Ki Jai, Jai Hind etc., in a very enthusiastic manner and the spirit of patriotism was quite pervasive in their voices and faces. Rajesh Narang, Secretary of the Society managed the affairs as convener of the programme. One senior lady, Mrs. Kusum Gulati sang a patriotic song in a melodious voice – “Yeh Desh Hai Veer Jawano ka albelon ka mastano ka …..” and entertained the whole audience and a few other ladies sitting nearby her, also joined her in singing this beautiful and patriotic song. Then R.D. Bhardwaj also sang an old Punjabi folk song – “Bhatta laike aayie Khet nu Jatti pandrah murabiyan wali, Kankan nach uthiyan vekh Jatdi de mukhde di lali ……. !” and the people enjoyed this Punjabi folk song in a new flavour. Thereafter, games were conducted for the residents of the Society. Musical Chair was played for two different age-groups. Hundred meters race for the girls / ladies, 50 meters race for the children, spoon and lemon race were also organized and the residents enjoyed the sports activities as well, as they are held on some select occasions only. Then prizes were awarded for the first and second position holders of various sports competitions and events. Thereafter, lunch was taken by all the residents.